Why build raised beds? Well, let me ask you: Wouldn't it be nice to be able to appreciate your plants and care for them without having to bend over too much? Shrubs and dwarf trees provide this luxury naturally (taller trees presenting a different challenge, of course), but for shorter plants, the answer is to bring the plants up to your level. But in addition to all that, I wanted a bit more out of this project. As you can see from the picture above, I capped off my raised bed to form an outdoor bench. This outdoor bench will come in handy both as a work bench and as a seating area for the weary gardener. Below I list the supplies (both necessary and optional) for building raised garden beds. Many will be obvious, but one may surprise you: "pruning saw." So let me explain. My own situation offers a great example of how useful a small pruning saw can be for such jobs. Years ago, I had a large tree removed from my yard. As you may know, it seems to take old tree roots forever to decompose! And for any project that involves digging, old tree roots present a formidable obstacle. Well, the present project does involve digging. Many a time, my shovel encountered a stubborn old tree root. Pruning saw to the rescue! When digging post holes in yards such as mine, there's virtually no other way to get past the roots manually. So although I list the pruning saw as "optional," it's hardly optional if your yard is anything like mine! Using the shovel and steel rake, prepare the ground for the raised garden bed by evening it out (see photo above), so that you'll have level ground on which to work. Is Pressure-Treated Lumber Safe for Raised Beds? Since my structure will be used exclusively as a raised flower bed, I built it with pressure-treated lumber. A long-lasting product, pressure-treated lumber is a relatively inexpensive material for building raised flower beds. 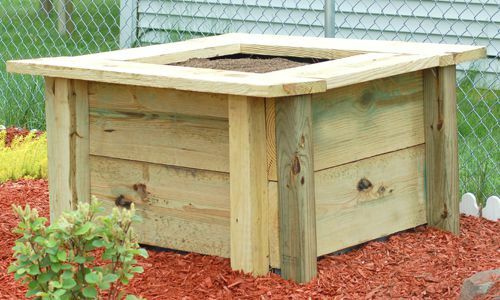 For raised garden beds devoted to vegetables, however, opt for a wood such as cedar, instead (stone and cinder blocks are other alternatives). Pressure-treated lumber contains preservatives that you probably don't want to have near food crops. Pressure-treated lumber used to contain CCA (chromated copper arsenate) or ACA (ammoniacal copper arsenate). Responding to concerns about the existence of arsenate (arsenic) in pressure-treated wood, in 2002 the lumber industry let it be known that they would soon be rolling out an alternative product, which makes use of a different preservative. The alternative pressure-treated lumber is called ACQ and is preserved with alkaline copper quaternary. ACQ pressure-treated lumber contains more copper than the old CCA or ACA, but at least it's free of arsenic. The picture above shows (right to left) an example of each. I built a small raised garden bed: roughly 3 feet by 3 feet in the interior (with 2' in wall height, achieved via two 2x12s). Just a bottomless planter box, really. For larger raised garden beds, the same instructions apply, only you'll need more lumber (and you'll have to adjust, accordingly, all the measurements I furnish in my tutorial). However, 4 feet is recommended as the limit on width for raised garden beds, as you want to be able to reach easily into the middle from either side. Dimensions of 12 feet long by 4 feet wide would have made for a more useful raised garden bed, but I just didn't have the room for that in the small space in which I was working. Here's the basic idea behind my project. The raised garden bed will consist of four pre-assembed walls (hereafter referred to simply as the "walls"), each of which is composed of two 2x12 boards screwed onto two 4x4 posts (hereafter referred to simply as the "posts"), one post for each end. See picture above. The extra 2 feet of post will be sunk into the ground, in order to stabilize the raised garden bed. After the walls are assembled, they will be brought over to the site of the raised garden bed. Holes will be dug in the ground, and the posts will be inserted into those holes. When the posts fit just right, braces will be attached to the walls, linking them together. The final steps will revolve around packing the dirt back into the holes (to secure the posts), filling up the raised garden bed with soil, and attaching the cap boards. If you're going to apply a preservative to the wood for raised garden beds, it's best to do so at the beginning of the project. Let it dry before pre-assembling the walls. 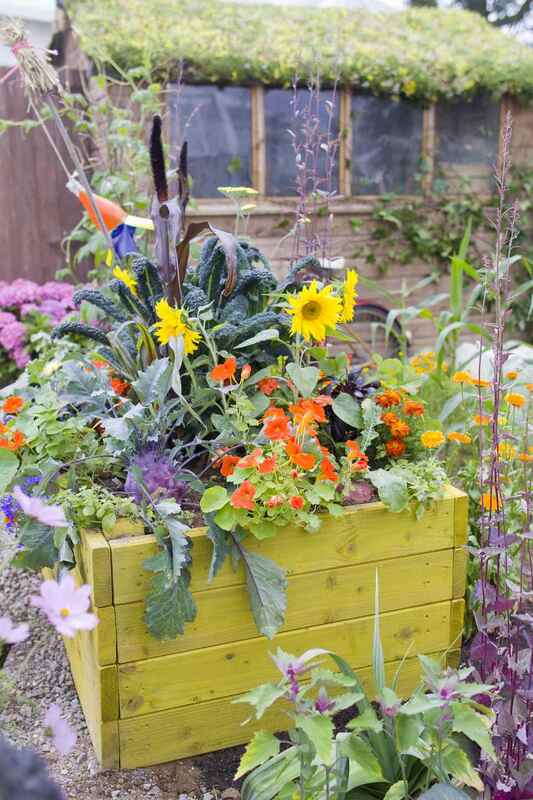 For raised garden beds meant for vegetables, stick to natural preservatives, such as linseed oil. The first step in the pre-assembly of the walls of raised flower garden beds is to lay out two of the posts on level ground, parallel to each and 3 feet apart. Now take one of your 3-foot long 2x12 boards, and lay it on top of the two posts, to span them, at one end. This will be your top board. Now take a second 2x12 board of the same length, and repeat -- only this time, you'll be laying the board further down across the posts. This will be your bottom board. After you've checked to see that the boards are square with the posts (you can use a carpenter's square), you can begin to attach them to the posts, using a few screws for each end of each 2x12. Pre-drill first, to eliminate splitting. You now have the walls of the raised bed pre-assembled, so you know what lengths they measure; now all you have to do is carry over those measurements to the site where the raised bed will stand and dig your holes, accordingly. In my case, that meant beginning with two holes about 3 feet apart. Remember, the idea here is to sink the posts into holes, to stabilize them. I began with the idea of digging my holes 2 feet deep (as I'll soon explain, though, I couldn't quite achieve that depth). Why 2 feet deep, specifically? Submerging half of the post's length would provide excellent stability. And that's precisely how much post I had left over at the bottom, after attaching my 2x12 boards to the tops of the posts. Once you've removed a decent amount of dirt from the two holes, bring one of the pre-assembled walls over and check to see how its posts fit into the holes. When you begin this checking process, you'll find it handy to have old lumber around, to use as temporary bracing (so your walls don't fall on you!). Once you have the two posts in the two holes, check to see if your wall is plumb and level. You'll also be better able to visualize now just how much more digging you'll be doing in these first two holes. Leaving the first wall in place (braced up with temporary supports, if necessary), bring over another pre-assembled wall and hold it up against the first one, so as to form a right angle. This will help you visualize your next step in establishing your raised garden bed frame. For, if it hasn't occurred to you already, at this point the idea should occur to you that you don't have to dig eight holes for the eight posts: you have to dig only four -- two posts to each hole. But you should now also be able to visualize that the holes will have to be wider than you might have thought, initially (to accommodate that second post). Now that you have some idea where this second wall should fit, begin digging accordingly. This means widening one existing hole and beginning a new hole. Continue to check for fit, as you proceed, by inserting the posts of this second wall into their holes. In the same manner, work on adding the third and fourth walls. Check for plumb and level as you go along. I encourage you to continue bringing over your pre-assembled walls, to check the fit, throughout the construction of the raised plant bed: a visual model is preferable to abstract measurements for most of us! Once you've roughly achieved the desired fit for all 4 walls, begin finalizing the depth of your post holes. You'll find that, inevitably, just as you think you've reached the desired depth on one end, your carpenter's level will tell you that the other end isn't cooperating! Once you don't think you're able to dig much further, it's time to consider shimming the low end. Small flat rocks make good shims. I lined the raised bed (walls and bottom) with landscape fabric. When filling my raised bed at the end of the project, I used coarse material (leaves and sod) to plug the gap. Most importantly, I mulched all around the perimeter of the raised bed. The mulch will pack down and prevent any soil from spilling out of the raised bed. In fact, considering my goals for the raised bed project, this setback actually has a positive side to it. How so? Well, remember, I desire not only a raised bed, but also an outdoor work bench (to be formed by the boards that will cap off the raised bed). The additional height I'm "stuck with" will furnish me with a more functional outdoor work bench (i.e., one closer to waist-level). Now it's time to join the walls of the raised bed together and give the structure some stability. Join the walls together at the corners, using corner braces, as shown in the picture above. Next, take the dirt you dug out of the holes and shovel it back into those holes, tamping it down as you go (I used a scrap 2x4 board for tamping). The boards shown intersecting in the picture above are the cap boards. Not only do they give the raised bed a more finished look, but they also provide me with the outdoor work bench I desire. If you want to get fancy, you can use a miter saw to put 45-degree angles on these boards. I used 2x12s for my cap boards. Perhaps 2x10s would have been preferable. But, as I mentioned earlier, I wished to keep this project simple (and cheap). When the lumberyard cut up the 2x12s for my wall boards, it was simpler and cheaper to use the leftovers for my cap boards, rather than buying extra lumber. Two of my cap boards are 4-footers; I attached these first, on opposite ends. I pre-drilled, then I screwed them onto the tops of the walls. They're lined up so as to receive support primarily from the 4x4 posts beneath. With the two 4-footers attached, I simply measured between them to determine how long the final two boards must be. I cut them accordingly, then attached them. Extra support can be provided for the cap boards by using metal braces -- corner braces on the inside, straight braces on the outside. As previously mentioned, I lined the raised bed (walls and bottom) with landscape fabric. The black you see in the picture above is the landscape fabric. I tucked it under the cap boards, before attaching the latter. If you have problems with gophers (or other tunneling garden pests), this is a good time to take ​gopher control measures. Line the bottom of the raised bed with a mesh (i.e., wire fencing with small holes) or with chicken wire. You will, of course, want to add compost, but there are other ingredients to consider, as well. If you have only a small amount of compost to add, you probably need something else to lighten the soil further. Peat moss comes in handy for this purpose. But for raised beds as deep as the one featured in this project, another issue arises when it's time to fill the raised bed. You'll probably ask yourself, "How the heck am I going to come up with enough soil, compost, peat moss, etc. to fill in such a large area?" In other words, the issue of using "fillers" arises. Drainage for raised beds is a double-edged sword. On the one hand, you need good drainage; on the other hand, good drainage means you'll need to water more often. Crushed rock (if you happen to have some lying around) or similar material provides excellent drainage. However, many of us aren't crazy about dumping rocks into planting areas; we typically think more in terms of organic matter when we consider our options for fillers. But organic matter, too, can have its drawbacks. Relatively fresh material (e.g., recently cut brush) will settle as it decomposes. You'll have to add more soil at some point to bring the soil level of the raised bed back up where you want it. There's another problem regarding the use of organic material that has yet to decompose: it uses nitrogen as it breaks down, thereby depleting the soil of nitrogen. So you'll end up having to add nitrogen to the raised bed's soil to make up for this depletion. But if the compost you've added to the pile has plenty of nitrogen in it (and it should, if it contains ingredients such as coffee grounds or manure), you may be able to compensate sufficiently.